Here’s the scary thing about girls dresses size 12: your girls are almost teenagers! Soon, they’ll be asserting themselves to the point of almost rebelling. That’s what makes our larger dresses so wonderful -- they appeal to her maturity and youth at the same time. Our sophisticated, yet effortless styles, are striking and bold. 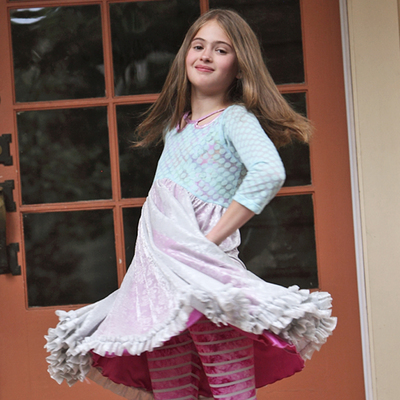 She can wear our twirly dresses & skirts with funky boots, or layer them with our leggings, hoodies, and tee shirts. It’s important for their emotional development to allow your girls to decide how they dress. With TwirlyGirl, you can be assured that whatever they choose will be age-appropriate as well as fabulous.